Headpieces can be used with a veil or without one and can be anything from fancy hats, to glitzy clips in your hair. In many cases, they are what the veil is anchored to. Depending on what hairstyle you want, and whether you have a veil or not, you can choose from a large array of different styles of headpieces that will be the perfect crowing touch to your wedding outfit. The profile headpiece is a decorative comb that looks fantastic with a fancier hairstyle that is pulled up or braided. No veil is usually worn for those who choose to go with the profile headpiece. It can be adorned with beads, lace, feathers, and other fancy decorative accents to give it even more style and glitz. 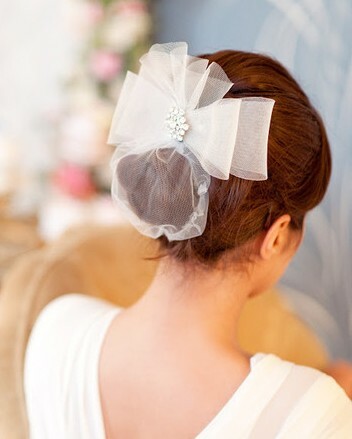 Many brides use it on either side to pull back part of her hair, or in the back if her hair is in a bun or French twist. 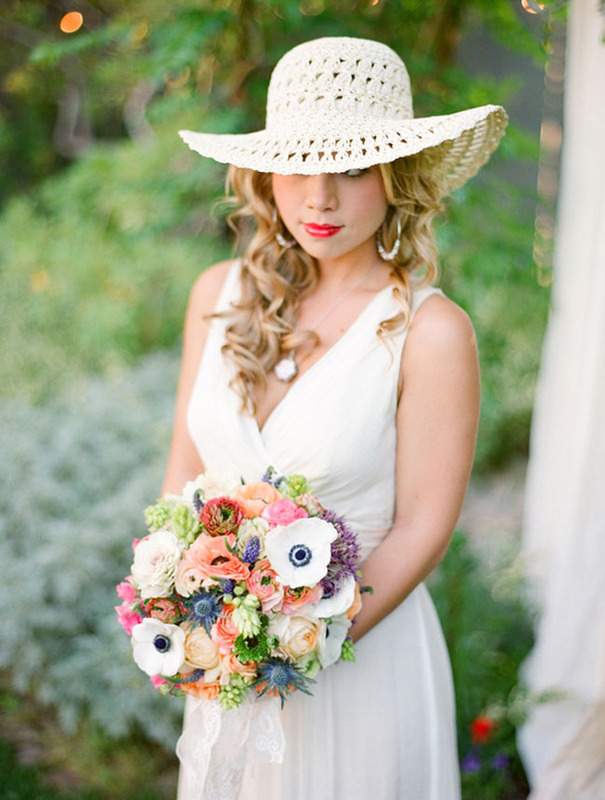 For brides that want to make a statement, hats are a great accessory. This style of head piece is well suited to outdoor weddings in warmer climates or seasons. If it’s a beach wedding, be sure to pin the hat to keep the ocean breezes from blowing the hat off. For more formal weddings, a vintage style hat works well also, and compliments a theme wedding. Be aware that hats can block the bride’s face, so the photographer needs to take this into account when taking pictures. Headbands are great headpieces to attach your veil to. It can be made of any material and can even stand alone as a headpiece without a veil if the bride chooses. 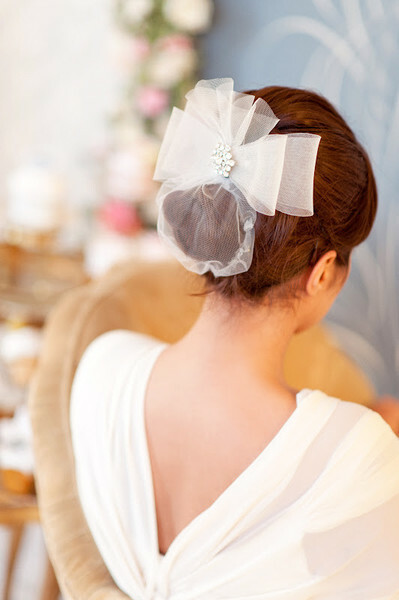 For a bride with long hair all one length, the headband can give a pretty and alternative look to her usual hairstyle. The Juliet cap can be worn with or without a veil and sits on the crown of the bride’s head. A Juliet cap can be made of any number of materials such as satin, lace or silk and is beautiful when beading and other decorative accents are added. 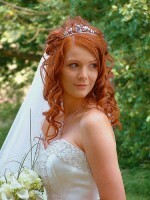 This style looks good on brides with long or short hair if the hair isn’t put up. A snood gives a beautiful, vintage look to any bride’s ensemble. The hair is put into a bun and the snood covers it. Snoods are usually made of netting and can be decorated with crystals, beading, lace and more. If a veil is desired, it can be attached to the veil just below the snood. Almost every bride wants to look like a princess on her wedding, and what better way to do that than by wearing a tiara? A crown-like semicircle headpiece, they are usually very decorative and can even have diamonds and crystals and other gems added to them for even more glamour. A tiara makes a great accent for a more elaborate hairstyle without taking away from it. Decorative hairpins are great accents for a bride who is wearing her hair up for her wedding. They can be decorated with crystals, flowers, diamonds, pearls and anything the bride fancies. They look wonderful in long hair that is flowing loosely except for a few key pieces that the bride has pulled up or back. A wedding crown is usually slightly bigger than a tiara, circling the whole “crown” of the head instead of just the smaller front area. The crown makes a great headpiece to attach a veil to and can add some flair and flash to the veil if the crown is adorned with crystals and diamonds. Attached to the hair at the top, the veil can be attached to it easily. The crown works well with long or short hair. This is a beautiful headpiece for an outdoor wedding and looks fantastic on long hair that isn’t put up. Wreaths can be made of any material, but most often is made of flowers and greenery. There are many styles of wreaths that a bride can have made for her big day. A wreath that has some flowers draping down the hair as well adds even more beauty to an outdoor wedding and gives an air of romance and femininity.